RAW is WAR! These socks are your worst NIGHTMARE because they have WAR in the teeth. 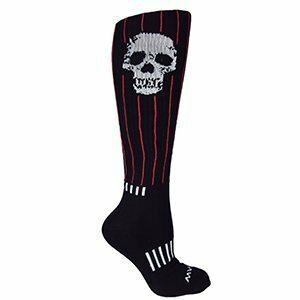 These premium custom woven WAR SKULL socks come complete with red pinstripes, the signature MOXY performance foot, and an edgy skull worthy of your darkest nightmares. Perfect for Crossfit, skating, lacrosse, and fitness. One Size Fits All, Black with Red and White.